My breakfast of choice has always been full of carbohydrates. Give me toast, muesli, porridge, bran flakes, cornflakes or Special K and I'm a happy bunny. Until about 10.30am, when the pangs start rumbling. Is it because my body processes carbs at a rate of knots and wants more please at coffee time? Or is it because I'm blood type O and so I'm naturally able to digest them at speed but unable to reap the benefit of all that slow sugar? Oh, hang on, O types should be eating meat not bread... (well according to that Kindle book of dubious quality anyway) so maybe carbs are not the thing for me at brekkie. Anyway, since I've discovered that we should be reducing our carb intake, and even milk is off the list for doing the opposite to what we've been told for years - it depletes bones of calcium so I can't even enjoy a bowl of cornflakes like I used to, I have to get my calcium and brekkie nourishment elsewhere. Cue the smoothie, or rather the thickie. No reflection on my brain capacity there (quoique...), but a thick smoothie, with green bits. Or is this just an excuse to use my new Omniblend blender? In December I bought a pressie from me to me - a wannabe Magic Bullet blender by Pradel which I got on Groupon. Isn't it cute? Just look at those lovely accessories. I loved the little grinder pots because they were so useful for chopping garlic, turmeric, and making exciting vinaigrettes in small quantities. Unfortunately, after three weeks it stopped working. I know I only paid 29 Eur for it, but Groupon said its retail value was 100 Eur (not that I've ever seen it at that price anywhere, but that's Groupon for you). It should have lasted longer than it took to arrive by post. Having got used to a blender, and finding that I needed it, I decided to buy one of much better quality. The Pradel was supposed to be a test to see if I would use one. I didn't expect to be testing it for quite such a short time, but even in the space of three weeks, I used it a lot (overkill?). On the websites I've been visiting recently in my quest for a healthier diet, all the bloggers have a high speed Vitamix blender. They wax lyrical about it and it's obviously the bees knees of blenders, and so it damn well ought to be at 650 Eur on Amazon! I didn't want to spend that sort of money on a blender - washing machine yes, blender no - so got my sleuthing brain in action and went on the hunt. 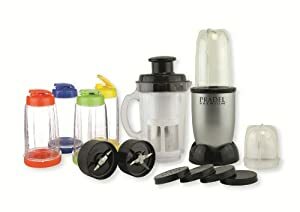 I came across a Taiwan-made version of the Vitamix - the Omniblend - that got rave reviews in comparative studies and costs 239 Eur on their website (down from 279 Eur). Free shipping too, plus a free nutbag with every purchase. Bingo! I've been having a lovely time whizzing up smoothies although the back of my mind has been worrying about the carbon footprint of all the exotic fruit that taste so good in them. I try to eat seasonally. Fat hope with a smoothie! Pineapple tastes so good in them; so does mango, kiwi and lychee. My Kindle is rapidly filling up with free books on smoothies and all sorts of diets like Paleo, gluten-free, dairy-free and so on. Often they are rubbish but don't come at a price so I ditch them without scruple. I found one book on making seasonal smoothies. One. And seasonal if you live in California, with access to kale etc... Not much kale in Montpellier... Not much use then. My boys saw me creating these yummy concoctions and I offered them a taste, and they started wanting more (which was my intention!). I then found the Green Thickie website where you can make a breakfast thickie that'll keep you going until lunchtime. I was actually finding that smoothies did a pretty good job and my mid-morning pangs were a thing of the past, but I wanted to get the balance better, and be able to sneak a more robust smoothie to the boys. The thickie recipe includes oats (or quinoa, or buckwheat or sweet potato), so a touch of carbs, along with the fruit, liquid, seeds, sweetener and greens (I like baby spinach). It calls for a cup of oats, but I didn't want to scare the boys off with a porridge-tasting smoothie, so have been adding oats little by little, increasing the amount each day. It seems to be working. I have not heard noises of disgust or complaints to the chef, and they are now going off to school with a better start than just stuffing over-sugared industrial cereal into their bellies. My eldest even wanted to make his own Sunday morning smoothie yesterday - du jamais vu! So there you have it. The Omniblend* is my new best friend. I am using it to make almond milk - the free bag comes in very handy especially as I wanted one anyway - tomato sauce, and drinks galore, and I want to try lots of the recipes in the book, including peanut butter. * this is not a sponsored post. I had to search for and buy everything all by my lil' ol' self so don't worry about me being a hired lackey bought for the price of blender... (although I'll take offers...). I hadn't thought of carrots in there. I tried adding beetroot but I'm really not keen on it even though it's so good for you. I keep trying to find ways that I can eat without being disappointed. I've been hearing lots of complaints lately about goods ordered online breaking down after a short time. I think 29 euros is a lot to pay for a device that does not last. Wow that's really impressive that they are eating all that lovely stuff in just a couple of gulps, worth twice the price for that. Like you I love carbs, though I do sometimes eat chicken for breakfast, actually often, just because I know if I start on the toast there is no end to it. I don't know what blood type I am, the most common I think - is that 0? Quite a while back, the wife and I purchased one of those fancy blenders/food processors with an e-voucher. Since it didn't cost us anything, we decided to buy top of the line. Damn motor started smokin' after a week and we trashed it. No warranty either. The following day, we saw one on sale on the High Street, bought it and haven't had one problem yet. That was nearly six years ago. Household goods are so expensive here - well, they seem to be to me - that i make do with what we have. I was missing a grinder too. I just had to bash away at the pestle and mortar. I can imagine that smoothies are not to everyone's taste. I think my brothers would scoff at the idea too. It's good that you are getting healthy breakfasts into your family. That's a lot of money for what is basically a blender, but if it's doing the job then a worthwhile investment. I had a juicer but found the amount of fruit and vegetables needed to produce a small glass of juice was crazy, so we just ate them instead. :) May your Omniblend bring you all health and happiness for many years. I bought a juicer a few years ago too and didn't like it. Then it broke and I didn't bother to replace it or mend it. I much prefer smoothies because you get all the fibre, and you can eat a variety of fruit in one glass plus sneak in other stuff to make it more nutritious. The price I paid is also the price for a good Moulinex so it's a lot but not that much. Not compared to a Vitamix anyway which is a ridiculous price. I am also a group 'o' and I don't know if I could manage without my toasts in the morning. Sad but true. How do you manage? I used to have a juicer but I gave it awry on Freecycle! I think it's probably not the same as a smoothie maker though, is it? No idea. I like the idea of a smoothie for breakfast but am far too disorganised to make it freshly every day. I do eat fruit for breakfast though - does that count?! Juicers can only be used for juicing. Blenders will blend or grind anything. I had a juicer too but didn't like it. I like eating the fibre in fruit as well as the juice. It didn't stand up to my youngest's attempts to make juice either so it got recycled.